Almost everywhere I look I see people in jeans with rips or holes in them (takes me back in time!). How do you suggest I wear this type of style? How do I know what cut and color to choose for my body type? Help! – Kim S.
Yes, this style has literally taken over the denim marketplace! More often than not we’re seeing distressed denim in all different colors and styles, and it’s still hard to wrap our heads around the fact that we’re paying for ripped jeans. However, it’s virtually inescapable and actually fun to play around with. If you’ve been following MSL this week you’ve seen how to wear some of the trends, but we’ll focus on the distressed look here. Distressed doesn’t have to mean fully covered in holes. It can be something as subtle as some worn-out patches or even just a few holes here and there. If you’re just learning how to work this look into your wardrobe, start with a pair that aren’t too distressed so it doesn’t feel that far away from your normal look. Cut is key. Always dress for your body type, not for the body you had 10 years ago or hope to have in 5 years. 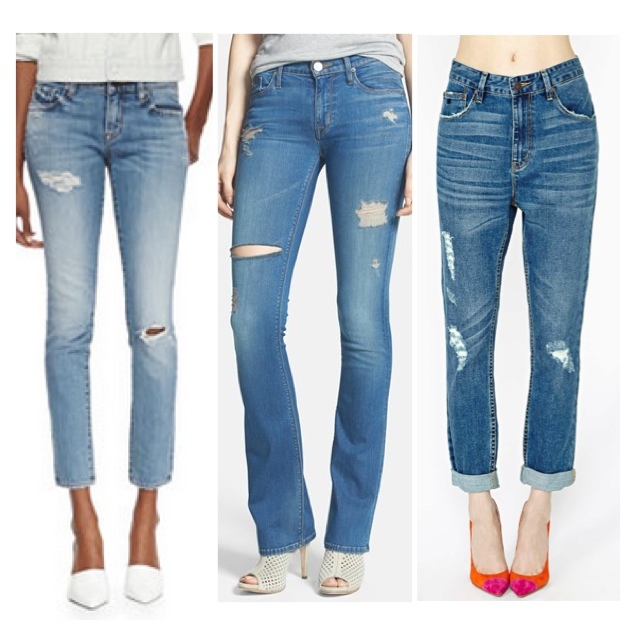 Good news — the cut of most distressed denim, in particular the boyfriend jean, is forgiving. Jeans are being worn slightly baggy as well as really fitted, so it’s honestly about what feels good to you. Wearing them on your hips doesn’t necessarily look bad, however we suggest thinking about your day-to-day activities before going with a low-rider pair. You can always belt a little slouch, just remember that adding a belt creates one extra step for a busy mom! Choose a pair of destructed jeans that fit on the waist but maybe have a little room through the leg for movement. This way you can play around with the top and have fun with the look!